Clean or “munge” social media data to prepare it for analysis. 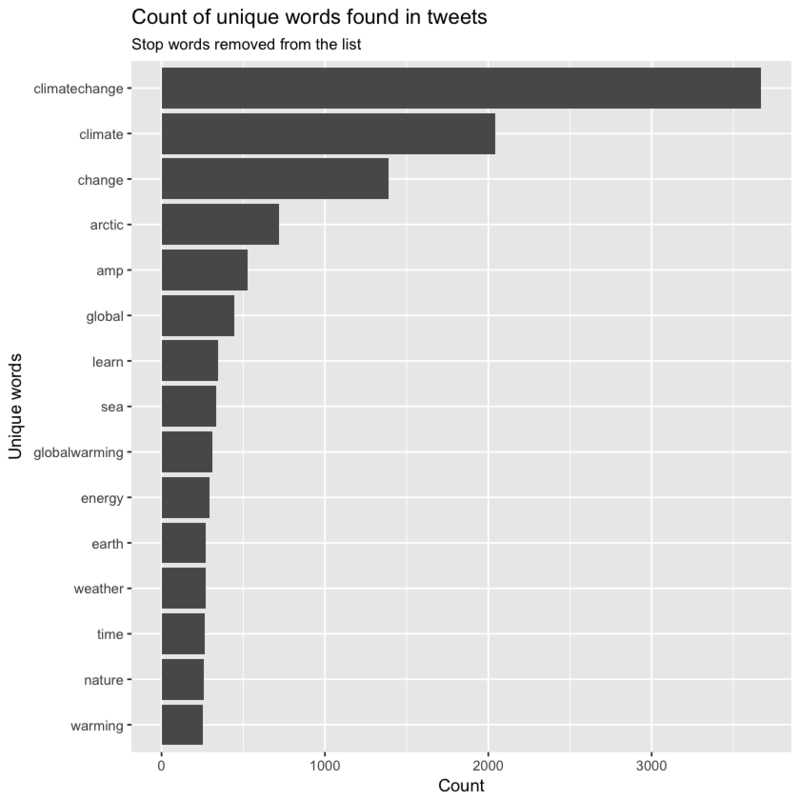 Use the tidytext package in R to explore and analyze word counts associated with tweets. In this lesson you will dive deeper into using twitter to understand a particular topic or event. You will learn more about text mining. However, the data generally have a set structure in terms of file formats and metadata. When you work with social media and other text data the user community creates and curates the content. This means there are NO RULES! This also means that you may have to perform extra steps to clean the data to ensure you are analyzing the right thing. Next, let’s look at a different workflow - exploring the actual text of the tweets which will involve some text mining. In this example, let’s find tweets that are using the words “forest fire” in them. First, you load the rtweet and other needed R packages. Note you are introducing 2 new packages lower in this lesson: igraph and ggraph. Let’s look at the results. Note any issues with your data? It seems like when you search for forest fire, you get tweets that contain the words forest and fire in them - but these tweets are not necessarily all related to your science topic of interest. Or are they? If you set your query to q="forest+fire" rather than forest fire then the API fill find tweets that use the words together in a string rathen than across the entire string. Let’s try it. ##  "Thank you @StanleyPJohnson for bringing #wildlife + #biodiversity loss into @BBCNewsnight debate on #environment, &amp;… https://t.co/r0PKh7lYX1"
##  "NGO´s Urge Shift To 100% Renewable Energy: https://t.co/8Z53igdfW5 #climatechange #climateaction https://t.co/oyye6Blepo"
##  "#CostaRica #Ambassador Roman Macaya Speaks About Importance of #Science #Diplomacy in 2018- #climatechange... https://t.co/LHZNxeRdUv"
##  "\"If you truly love nature, you will find beauty everywhere\". ~Vincent van Gogh https://t.co/I7Y5LKgxnf… https://t.co/aHz23p0885"
##  "Currently watching the movie, #DayAfterTomorrow on @AMC_TV If this isn’t what is playing out in our world currently… https://t.co/6nFrWXyp23"
##  "The latest The climate Daily! 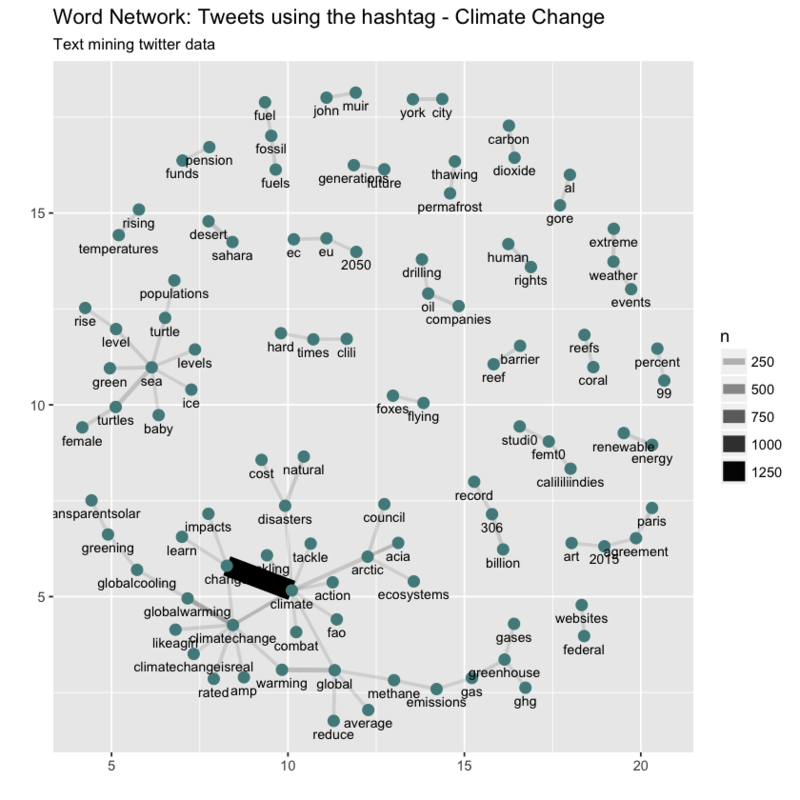 https://t.co/lF4wusZXEB Thanks to @Gail7175 @nordstjarna @setyourmindfree #climate #climatechange"
Looking at the data above, it becomes clear that there is a lot of clean-up associated with social media data. First, there are url’s in your tweets. If you want to do a text analysis to figure out what words are most common in your tweets, the URL’s won’t be helpful. Let’s remove those. Finally, you can clean up your text. If you are trying to create a list of unique words in your tweets, words with capitalization will be different from words that are all lowercase. Also you don’t need punctuation to be returned as a unique word. ##  "Dog" "dog" "cat" ","
Convert text to lowercase: each word found in the text will be converted to lowercase so ensure that you don’t get duplicate words due to variation in capitalization. The column name from the data.frame that you are using that you want to pull unique words from. In your case, you want to use the stripped_text column which is where you have your cleaned up tweet text stored. # remove punctuation, convert to lowercase, add id for each tweet! Now you can plot your data. What do you notice? You plot of unique words contains some words that may not be useful to use. For instance “a” and “to”. 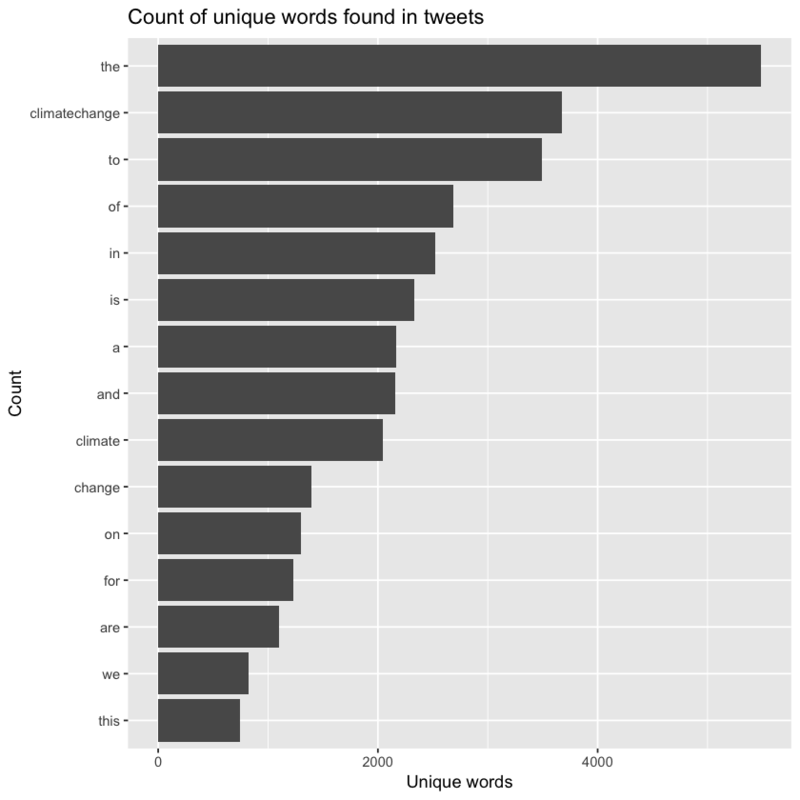 In the word of text mining you call those words - ‘stop words’. You want to remove these words from your analysis as they are fillers used to compose a sentence. Load the stop_words data included with tidytext. This data is simply a list of words that you may want to remove in a natural language analysis. Then you use anti_join to remove all stop words from your analysis. Let’s give this a try next! Now that you’ve performed this final step of cleaning, you can try to plot, once again. You might also want to explore words that occur together in tweets. LEt’s do that next.